Steps to Priscilla Landing and Nauset Beach! 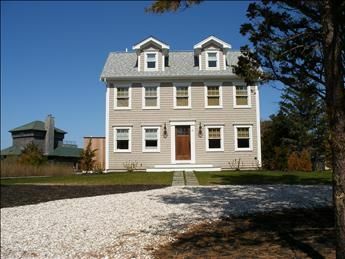 Priscilla Landing is on the Nauset Estuary and has private pathways to the Atlantic. The first floor has 3 bedrooms. One room has Queen sized bed with a private bath. Second room as 2 twins also with a private bath. The Master suite has a King sized bed, Private Bath with walk-in shower and a sitting area with a High Definition Plasma TV. A convenient laundry rounds out the ground floor. The custom oak stairway leads to the second floor where you find an open Chef ready kitchen, a dining area which opens onto a deck with Atlantic Ocean and Nauset Harbor views, an ultra comfortable sitting area with a High Definition wall mounted wide screen TV, a state of the art sound system with multiple speakers installed throughout the house (including the outdoor decks), a private library with wrap around Ocean views, and a powder room for your convenience. The next flight of stairs takes your vacation to another level. The third floor is the perfect place to entertain with panoramic Atlantic Ocean views, a wonderful deck, comfortable leather seating, a wet bar and again High Definition TV and superb sound system. This home is all new construction and second to none in detail inside and out. Do not worry about making dinner reservations, you will not want to leave. This vacation home is totally 1st CLASS.